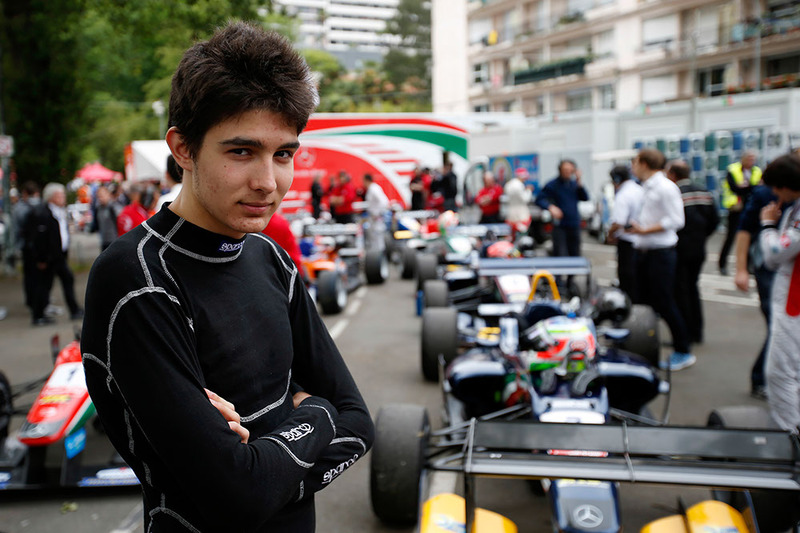 An assured Esteban Ocon took pole at Pau. © FIA. 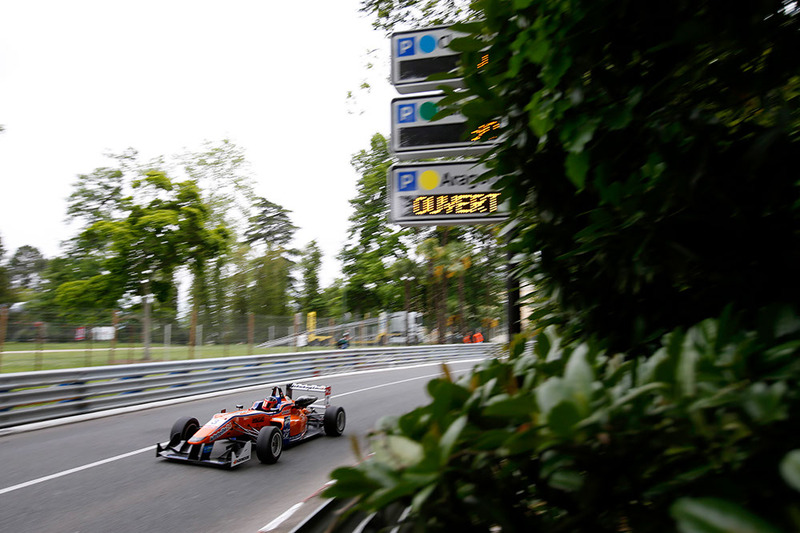 Prema Powerteam’s Esteban Ocon took a stunning pole position for tomorrow’s first FIA European F3 race at Pau. With the field split into two groups, the Frenchman secured the top spot in ‘Group B’ (for odd-numbered cars) with a stunning lap at 1:10.072s, just 0.024s ahead of Max Verstappen who will start on the second row. After taking the lead in ‘Group A’ (for even-numbered cars), Lucas Auer will assume the 2nd spot on the grid. Ocon was peerless for the duration of qualifying, with the teenager jumping straight into the 1’10s in his first serious attempt in the session. Heading the field at the halfway point, Ocon initially faced challenges from Carlin duo Ed Jones and Jake Dennis; however the session was soon red flagged when Roy Nissany crashed into the barriers at the exit of Pont Oscar. Following the restart, Verstappen also jumped up the order, just 0.014s shy of Ocon, before the Dutch racer went top with a two-tenths improvement on the 14-minute mark. Ocon responded moments later with another fastest lap (1:10.435), just before Verstappen recorded another lap, a mere 0.003s shy of the leading French racer. Just as the Ocon / Verstappen battle began to hot up, Jones crashed going into Foch, bringing out a second red flag. The Dubai-native climbed the kerb upon entry, which unkindly flicked his Carlin machine toward the unforgiving barrier. With the session restarting four minutes from the end, Ocon and Verstappen continued their fight; however both took their battle far beyond the rest of the pack as, first across the line, Ocon recorded the eventual pole time, followed by Verstappen several seconds later. Dennis van de Laar showed improved form in his Prema machine to assume the 4th quickest lap, while the crashed Jones will have to settle for the fifth row. Meanwhile, Auer (Mucke Motorsport) took the top spot in ‘Group A’ closely ahead of Nicholas Latifi (Prema Powerteam) and Tom Blomqvist (Jagonya Ayam Carlin); however Blomqvist must take a 10-place grid penalty for changing an engine at the Hockenheimring last week. The Austrian jumped to the lead pack at the halfway mark of the 20 minutes, perching his orange-and-blue liveried machine just two-tenths shy of early leader Blomqvist; however Auer would better that significantly as the session aged. A lap at 1:10.699 brought Auer to the head of times after 12 minutes, with the Mücke racer tearing another quarter-of-a-second off of that on the next tour around. Auer’s final fast lap knocked Latifi (1:10.559) off the top, but the Canadian remained in 2nd place until the flag, while Blomqvist’s late effort (1:10.748) propelled the Anglo-Kiwi to 3rd place, mere hundredths ahead of teammate Jordan King. Felix Serralles was placed in the top three for a time; however the Puerto Rican crashed on his final run and dropped to 5th as a result. Neither Antonio Fuoco nor Felix Rosenqvist could take any advantage from the session. Following his practice crash that cost him nearly an hour of practice time, Fuoco could manage a 10th best time (1:11:097s), while an engine issue for Rosenqvist kept the Swede in the pits until the final minutes; however Rosenqvist could only set one representative lap, giving him 11th in the order. As an aside, Nissany unwisely tackled the marshal’s as they removed his wounded Mücke machine. It was a silly action from an experienced driver who should know far better by now, but with the Israelite already starting last, how many other ways are there to punish him? Blomqvist receives 10-place grid penalty for engine change at Hockenheim.